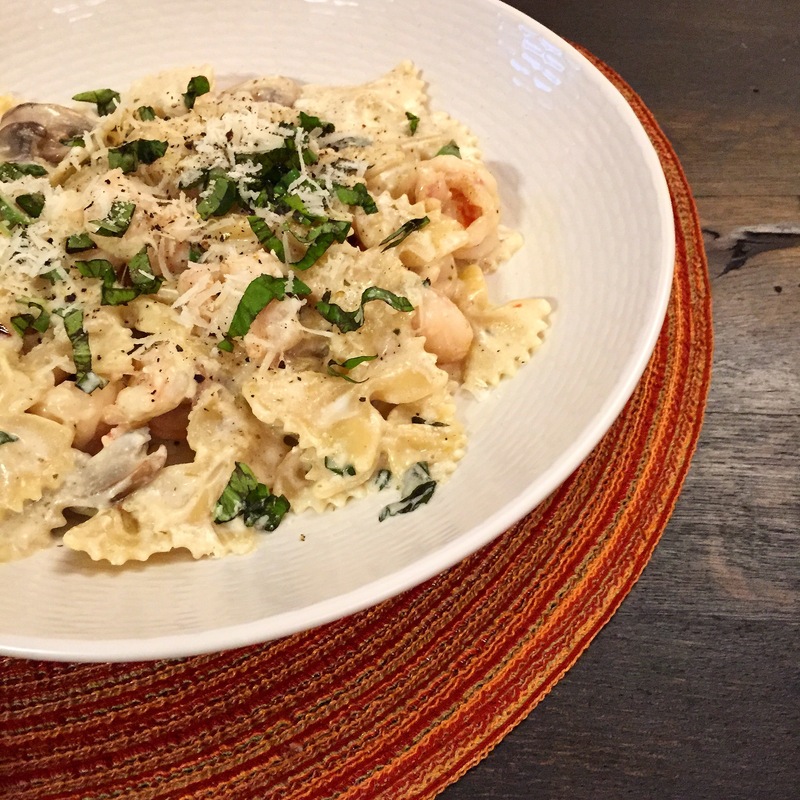 Italian Dreams: Farfalle with Shrimp and Mushrooms in a Pesto Cream Sauce – Pao Says, "Open Wide!" I just saw Giada in Italy on Food Network… So obviously I began to feel serious cravings for pasta. Honestly, can you watch her even talk without your mouth watering for Italian food? She could be talking about auto repair, and I would still need to feed my need for pasta ASAP. So, as a result, after Giada’s show was over, I immediately proceeded to my kitchen to get to work. I caught sight of a box of bow tie pasta (farfalle) next to some (shelf-stable, from Trader Joe’s) heavy cream** in my pantry, and the dish came together in my head. Knowing I had plenty of shrimp in my freezer, and some pesto I had whipped up earlier this week in my fridge, I got to work on my bow tie with shrimp and mushrooms in a pesto cream sauce. Really easy and straight forward recipe… Great for entertaining! 2-3 tbsp pesto (recipe HERE)… If you don’t have any pesto, you can just add about 1/4 cup chopped basil- not the same, but it’ll still be good! Salt some water- once it boils, add in the farfalle. As the water heats and the pasta is cooking, chop your garlic and mushrooms and take the tails off your shrimp (and halve them, if you’d like). In a separate large sauté pan over med-high fire, heat 1-2 tbsp olive oil and melt the butter (set aside 1 tbsp of the butter to finish the sauce). Add in the garlic and shrimp with a sprinkle of salt and pepper. Once the shrimp cook and begin to turn pink, and the garlic becomes fragrant, use a large slotted spoon to remove the shrimp and garlic from the pan and set aside in a bowl. Add a bit more olive oil and toss in the sliced mushrooms. Once the mushrooms start to become tender, stir in the cream. Let it reduce a bit on simmer for about 3-5 minutes, then add in a mix of 1/2 cup pasta water and 1 tsp cornstarch. Once this is combined and the sauce begins to thicken, add in the pesto and then ladle in the cooked bow tie with a slotted spoon or a small sieve (transferring the pasta this way will add some pasta water in the process). Sprinkle the cheese over the farfalle on the sauce before combining it (as Giada says, the cheese will stick to the hot pasta, and the sauce will then stick to the cheese that’s stuck on the the pasta, ensuring ultimate deliciousness!). Mix everything together and then re-introduce the shrimp and garlic. Top with chopped basil, Parmesan, and black pepper. Bon apetit!